It was another busy day for the UK-Racketball Series heading to one of our regular clubs Limpsfield for a 3rd consecutive year. Jenny Preston battled hard against all opposition defeating Lois Hutchinson and losing out narrowly to local club favourite Chrissie Mariner. Mariner came through in second place in the end after being defeated by much more experienced UK-Racketballer’s Kathryn Milne and Natalie Lawrence. In the deciding group match Milne had her chance at 6-0 up in the 2nd but Lawrence is experienced in the UK-RacketballSeries and stayed steady to come through 2-0 and add another title to her collection. Billy Jones came close against Manor Champion Mark Fuller in the opening A grade match. Leading in the first before Fuller came back and then taking the second in a tie break. Eliot Selby moved to well and was too strong for Jones but despite taking the first game and getting to 8-8 in the decider could not quite make it over the line against Fuller. Group B was the Ted Jeal show. Not dropping a game and showing off his full range of attacks! The final was one sided. Fuller was stuck retrieving from Jeal and unable to make him move like he did in the Manor. Jeal was doing what he does best putting pace on the ball and attacking, Fuller retrieved well but in the end it was always going one way, 11/8, 11/7 to Jeal, revenge for The Manor and back to claiming UK-Racketball titles. Natalie Lawrence could not continue her winning ways in the B. She took Rob White close but finished with just one point in group A. UK-Racketball favourite Ian Scanlan came through as the eventual group winner without dropping a game. It was experienced Ian Furlonger who came through in group B with even group runner up Steve Boyes failing to gain any change out of there match being defeated 2-0. Local player Vinny Dunhall came through group C against Gavin Bentley and Michael Keogh winning both matches 2-0. Group D made up the last group in the biggest draw on the day with another 4 players. Youngster and fast improver Sam Jeal came through without dropping a game. The semi-finals were closely contested. Furlonger kept it too tight for Scanlan and Jeal was a bit to fast for Jeal setting up a contrasting styled final between the Series veteran and the up and coming young gun! It was close all the way in the final but in the end Jeal had improved just enough to come through and take the title! It was a tough group with David Mckenna coming through as the eventual winner but David Morse came in a close second losing the group decider 2-1. Marc Thornley came through the group without dropping a game with second place being tightly contested between Vinny Dunhall and Brendon Bennett. Mckenna. It was a tough battle but went against the normal result with Thornley taking the match 11/7, 4/11 and 11/6 in the decider. The match was a slog fest with both players struggling to bring in there short game but in the end Thornley was to consistent when it mattered, back to UK-Racketball Title winning ways. It was three big groups that lead into a three way deciding group to decide the Over 50’s so plenty of matches if you wanted to win it. Henry both claimed a game off him. This was the only group in the day where the eventual winner was taken to a decider in two of his group matches. In the finals group Mike English looked tired from his earlier group exploits and his battles in the A. It was another great entry into the Over 60’s with three evenly numbered groups and 3 matches in each group making for a tough days racketball for the vets! Group A was very tight with Graham Greensall just sneaking through against Brian Wilmore and winning the group by just one point. Group B proved more comfortable with Devon and Exeters David Mudge coming through all three matches 2-0 including good wins over experienced UK-Racketballer’s Jeremy Hughes and Ed Smith. Robin Soar again battled hard all day pushing Baz Kilinster all the way in his early group match. In the end it was Peter Willmore who came through as the winner defeating John Vaukins in the group decider. In the winners group Graham Greensall just sneaked through against David Mudge 2-1 but didn’t have enough to take out Peter Willmore who came through the whole of the over 60’s without dropping a single game all day. 10 games won without dropping one! As always the beginners received a great entry in Limpsfield. It was a 8 player draw with all but one coming from the home club. As the entry list would suggest it was a local player who came through with the events only junior Phoebe Colman coming through as champion. In group A Mike Jones came through all his games winning them 2-0 but unfortunately had to withdraw before being able to play in the final giving group runner up Richard Cheadle a chance to go through. Group B was dominated by Phoebe Colman who is a top local squash junior who made quick work of her opening games. Terri Orr played well defeating both Paul Bolton and Elizabeth Lewis-Orr 2-0. Limpsfield will again be hosting the first UK-Racketball southern event of the Series. With a proactive committee and thriving Racketball section, the event in May is eagerly anticipated. Last year the venue received one of the highest entry levels with over 80 players and came 2nd in our end of year “most liked club” poll. 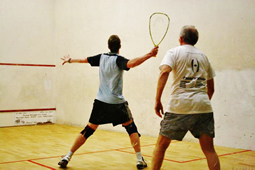 Limpsfield is a premier club in the squash and racketball world with several squash teams in the Surrey league including the PSL. With a local sponsor and many keen members willing to help on the day, this year’s Limpsfield Racketball Open looks like one not to miss. Limpsfield local players picked up several home titles at last year’s event and it became known as the ‘Maker of Series Champions’; Ted Jeal opened his account at this event on the way to becoming 2013 UK-Racketball Series Champion.